St. Martin's Press, 9780312356460, 321pp. Devon's not sure he can handle one more surprise ingredient in his life he quit his popular TV show, his culinary reputation is on the line, and now the son he barely knows is back for seconds. Lilah's Southern sass is supposed to keep the boy in line, but soon enough she's teaching Devon a thing or two about homespun food and turning up the heat. Louisa Edwards is the author of "Can't Stand the Heat" and" Just One Taste." She grew up in Virginia, where at the age of 11, she was already sneaking Harlequin romances from her grandmother's suitcase, much to her parents' horror. She graduated from Bryn Mawr College before moving to Manhattan to work in book publishing a dream job that allowed her to earn a living by reading romance novels. She later moved to Ohio, where she worked as a restaurant reviewer. 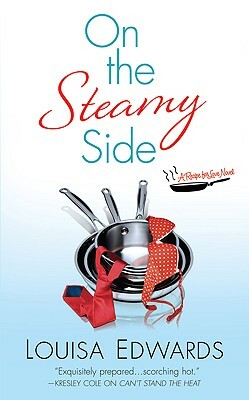 The Recipe for Love series combines her love of food and romance. When she's not writing, Louisa eats at as many wonderful restaurants as possible purely for research, of course."